One of the strangest places I’ve been during my travels has to be the demilitarized zone (DMZ) in South-Korea. I had no idea one could even visit this notorious area. The DMZ is a 2.5 mile wide strip of land that stretches across the Korean peninsula, separating the South and the North. Installed at the end of the Korean War, it is meant to serve as a buffer zone, to prevent hostilities between the two countries that, officially, are still at war. In the center of the DMZ lies the Military Demarcation Line, which functions as the political border between the two countries. 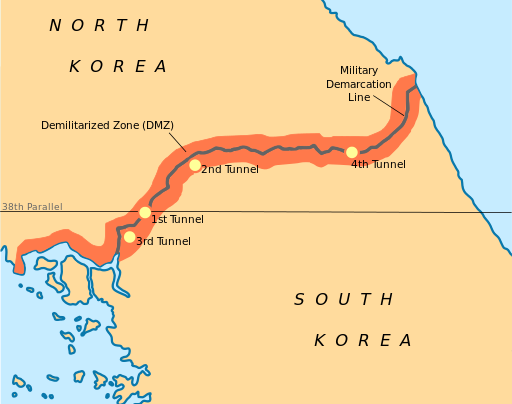 Several tunnels have been found by the South Koreans, one of which is open to the public. The tunnel is refered to as the Third Tunnel of Aggression. Unfortunately, it’s not allowed to take pictures inside the tunnel so if you want to see what it looks like you’ll have to visit yourself. 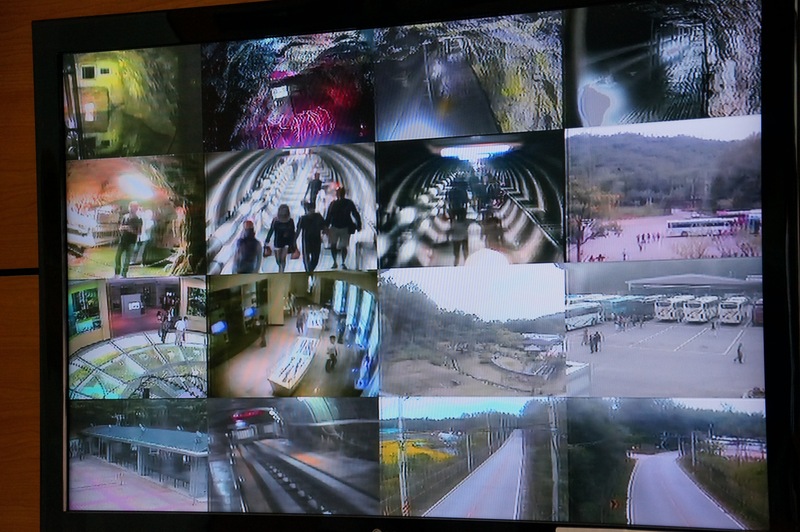 To give you a bit of an idea, I took a picture of a TV-screen that showed views captured by the many security cameras. Click on the picture so see a large version. 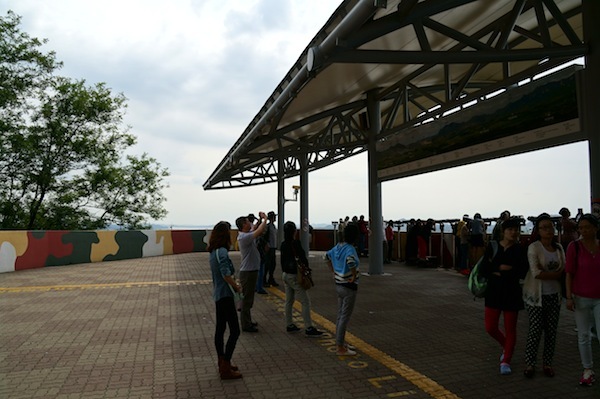 The best point along the DMZ to peek into North Korea is the Dora Observatory, situated on top of Mount Dora. Here you can catch a glimpse of what North Korea looks like, using one of the many binoculars that have been installed. Clearly visible is the so called “propaganda village.” It features a number of brightly painted, decent looking apartments blocks, all wired for electricity. The village aims to create an illusion of luxury living, but in reality the buildings are concrete shells and no-one actually lives there. Taking pictures at the Dora Observatory is a little tricky. You have to stand behind a yellow line, several meters away from the edge of the lookout. This is to prevent north Korean soldiers from accidentally interpreting a flash camera as a gunshot. 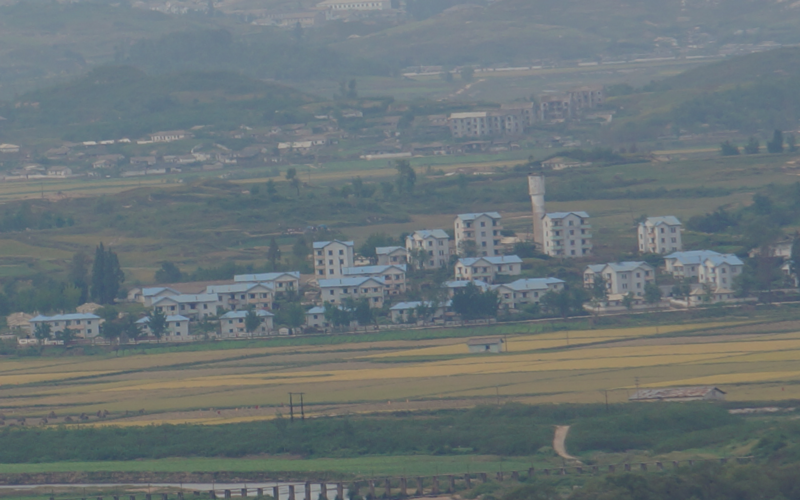 Some other landmarks are visible, such as the city of Kaesong, including the Kaesong Industrial Complex, and a statue of Kim Il Sung. Several memorial sites have been put up along the DMZ. Some in memory of the soldiers who lost their lives in the Korean War, others to symbolize unification wishes. Have you been to the DMZ? Let me know your thoughts! Nice arcticle! I have experienced it from the other side. That’s was also an incredible experience!